Celebrate the Cul2vator Graduation: Ricky Coley! 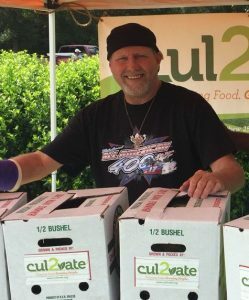 Ricky Coley wasn’t sure what to think when Cul2vate founder, Joey Lankford, approached him for the first time talking about working out on the farm. “I had worked hard all my life,” Ricky said, recounting his thoughts to Joey’s proposition, “I decided I wasn’t going to work like that anymore”. Last month, Cul2vate employees, board members, champions and friends celebrated Ricky’s graduation along with fellow Cul2vator Joe Hill. The two were honored with a ceremony in the barn where friends and colleagues – including Jai Templeton, Commissioner of the Tennessee Department of Agriculture – spoke on their dedication and hard work. Ricky did not know what to expect of the program at first; he almost ended up never coming to the farm in the first place. “When he said it was spiritually based, that is what brought me in,” Ricky said, “I had another full-time job lined up with more money and I prayed about it. Something told me this is where you need to go. So I thought, ‘I’m just going to trust God.’ I ended up here”. In August, Ricky will be enrolling in the Missions Residency Training Program and taking a mission trip to Appalacia. We are so proud of how Ricky has grown since coming here and will miss him terribly. We are thankful and grateful for the way he contributed to our community here at Cul2vate and are so excited to see what he will do from here. “I’m at a point in my life when I can serve others. I don’t know when that happened. But I’m going to trust Him”. Join us in praying for Ricky as he continues to follow the path God has set for him!